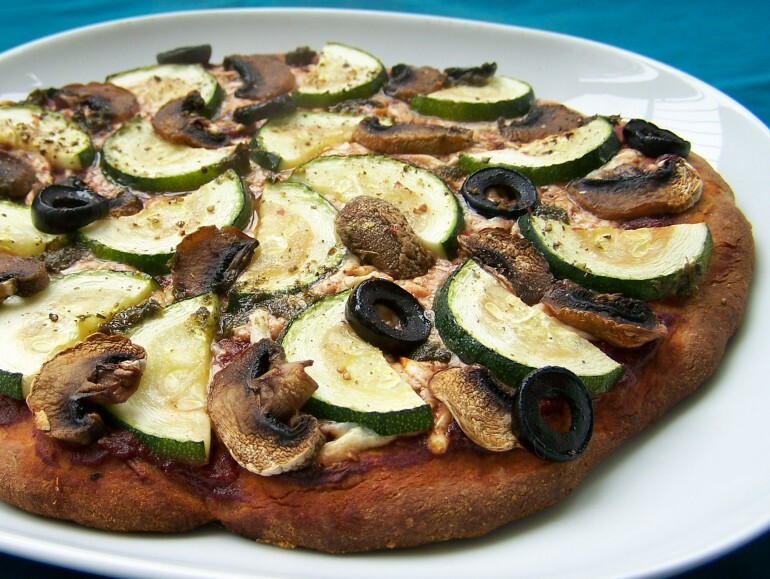 Low carb pizza, completely vegan! I really like pizza, real pizza. Cauliflower crusts and what have you can be good too, but sometimes I just want my pizza to have a bread crust. That's where this recipe comes in. 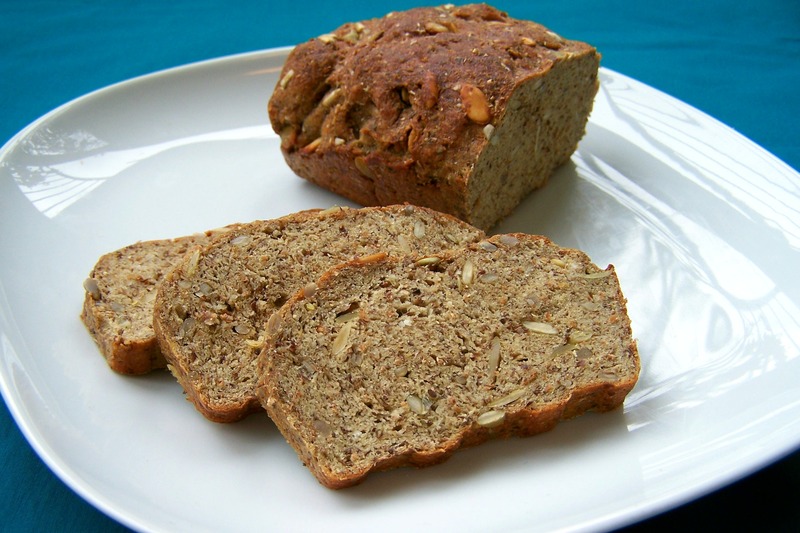 As in my other low carb bread recipes, I used wheat gluten for authentic bread texture, but replaced the starches that are in normal flour with proteins and fiber. The ingredient list seems kinda long, but that's mostly because of all the spices that go into this. It's not a complicated recipe. You can top the pizza any way you like. I just suggested some of our favorites. Because of all the high protein flours, this recipe is incredibly filling. Half a pizza will easily fill you up, so one pizza serves two. If you want to lower the carb count even more, replace the soy flour with protein powder. Put the dry ingredients (soy flour to thyme) into a bowl. Make sure they are well mixed and there are no lumps. Add the water and olive oil and mix with a fork until it forms a dough. Knead the dough with your hands for a minute or two. Sprinkle a little extra soy flour or protein powder on a clean work surface and with your hands or a rolling pin, form the the dough into a thin round disk with a 25 cm/ 10 inch diameter. Transfer the disk onto a piece of parchment paper and cover it with plastic wrap. Put it in a warm spot and let it rise for one hour until the dough has puffed up a little. Preheat the oven to 200 C/ 400 F. Make a quick tomato sauce by mixing the tomato puree with the garlic, thyme and oregano. Spread the sauce onto your pizza crust. Sprinkle the cheese onto the sauce and divide little dots of pesto over the pizza. Put on the sliced zucchini, mushrooms and olives in a nice pattern. Spray the pizza with some olive oil (or brush some on if you don't have a spray can) and sprinkle it with a little salt and pepper. Bake the pizza for about 20 minutes, until the toppings are done and the edges have browned. Half a pizza crust (one serving) without the toppings contains about 343 kcal, 21 g fat (2 g saturated), 9 g net carbohydrate, 8 g fiber and 26 g protein. Half a pizza (one serving) with toppings contains about 470 kcal, 32 g fat (3 g saturated), 15 g net carbohydrate, 8 g fiber and 28 g protein. Low carb vegan focaccia Low carb tortilla wraps, vegan! Lettuce wraps with olive-lemon seitan Real bread, low carb vegan style! Oops, sorry forgot to translate that bit from Dutch. It means 'plus a little extra for rolling out the dough'. I'll update the recipe asap. Hi Scott, I'm happy you enjoy this recipe! The 'net carb' count is indeed the digestible carbohydrate without the fiber, which is listed separately. All the low carb eaters I know only count the digestible 'net' carbs in their daily total carb amount, and not the fiber. This makes sense, since fiber is not broken down in the small intestine and does not influence blood glucose like the digestible carbs. Rather the opposite, it slows down the rate with which sugars are absorbed into the blood stream. Hope this helps! Hi Martine, Thanks for the quick reply. I think you answered my question but maybe misunderstood. For example, when calculating the net carbs in the pizza crust, I would only count this as 1 carb based on the fact that you can subtract the fiber from the net carb count. In the case of the pizza, it would be for half of the crust, 9 carbs minus 8 fiber equals 1 (9-8=1). I've heard from nutritionists that this is how you should count carbs based on the fact that fiber somewhat negates the effect of carbohydrates on the body, as you mentioned above. This looks awesome! Quick question, though - any recommendations for subbing the almond flour? Thanks! Hi Sarah, you can leave the almond flour out or sub it with a little extra soy flour. Enjoy the recipe!